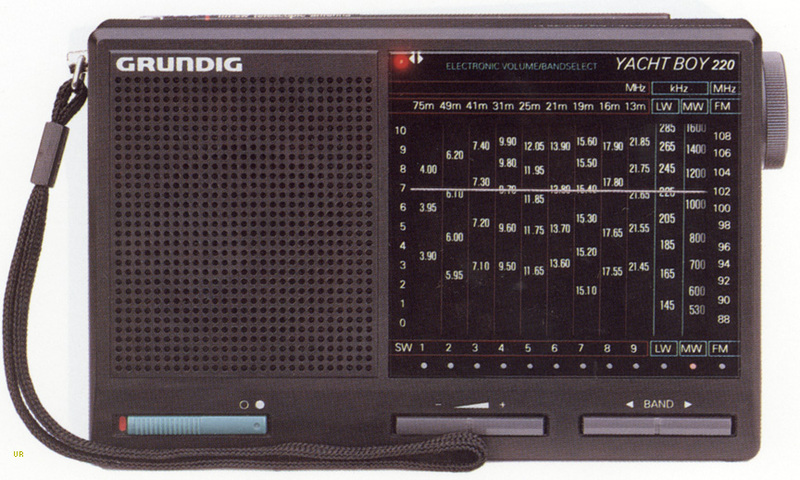 The Grundig Yacht Boy 220 covers longwave 140-290 kHz, AM 515-630 FM bands plus it has nine shortwave bands: 3.9-4, 5.95-6.2, 7.1-7.4, 9.5-9.9, 11.65-12.05, 13.6-13.8, 15.1-15.6, 17.55-17.9 and 21.45-21.85 MHz. 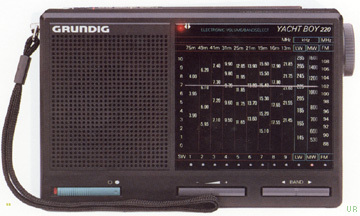 This radio features: electronic band switching, electronic volume control, three position tone switch, tuning indicator, wrist strap and earphone jack. Operation is from 3 AA [UM3] batteries (not included) or NR30-75 external power adapter.